For what reason is Christ the mediator of a new covenant? What sins does this passage say Christ’s death redeemed? What is the first covenant that is referred to here? Who are those who have been called? What does verse 15 show us about salvation in the Old Testament? What does verse 16 mean? Why does there need to be death when a covenant is made? 1 Timothy 2:5 – One mediator between God and man. Romans 8:34 – Christ is interceding for us. Christ is the mediator of a new covenant because it was His blood which was shed for us. He got this privilege/responsibility because He was the only one who could mediate this covenant. He is the God-man. Because He is God He has no sin and He has the ability to take away our sins. Because He is man, he can be our representative. It is Christ that bridged the gap between man and God. What application can we get from this? It think one is that we must have a close relationship with Jesus. As we learn in John 15, apart from Him we can do nothing. The Christian life is not about going to church and reading the Bible and praying. These are means to an end, not the object itself. What is the end? It is to develop our relationship with Jesus. Jesus’ death redeems the people who sinned even during the Mosaic covenant. In the last few chapters we have learned about the weaknesses and flaws of the Mosaic covenant. We have seen that it cannot make people perfect before God. We have seen that there is no real solution apart from Christ’s sacrifice for us. We have seen that the Levitical priesthood and daily sacrifices could not restore people to God. A natural question which stems from this would be, “then how could people in the Old Testament be saved?” How would you answer this when someone asks you (have you been asked before)? The answer is that it was never the lamb sacrifices or blood that saved people in the OT. These were a foreshadow of Jesus’ sacricice. This verse makes it very clear that Jesus’ sacrifice was applied even to sins which had already been committed and even to people who had already died. In the New Testament era we are saved by looking back at Christ’s sacrifice. In the Old Testament people could also be saved, but by looking forward to Jesus’ sacrifice in faith. God can act outside of time and therefore Jesus’ sacrifice can be applied to past, present, and future sins. This shows us God’s great mercy in providing a way of salvation for people throughout history. 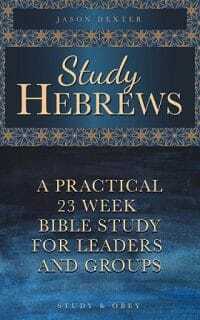 In Hebrews 11, we will learn that many of the “heroes of faith” from the OT died without receiving the promises of God. But here we see that all who are called by God will receive the promise of an eternal inheritance, making their sacrifices worthwhile. Verses 16-17 appear very confusing at first glance. Why should death of the covenant maker be necessary for the covenant to be enforced? After all, God didn’t die when He made the covenant with Noah, Abraham, or Moses. However, according to MacArthur the word translated as “covenant” is more general and can mean “testament.” He argues that in this context it means something like “last will and testament.” For a will, it only goes into effect when the person who made it dies. With this understanding, the verses make sense. Basically they mean that for God’s promises of salvation and redemption to be fulfilled, Jesus had to die, and they were only fulfilled when Jesus did die. These verses, then, show that Jesus’ death was necessary or else God’s promises (even those made in the OT) couldn’t take effect. What was the importance of sprinkling with blood? What was the symbolism of it? Imagine an unbeliever asks you the following question: “Why do Christians obsess over blood? How can the blood of a man who lived 2000 years ago help you?” What would you say? Exodus 24:1-8 – The ratification of the Mosaic covenant required shedding of blood. Matthew 26:28 – This is my blood which is shed for you. Ephesians 1:7 – Redemption through His blood. Blood was used to ratify the Mosaic covenant. See cross-references. When God made a covenant with Abraham, animals were also killed to ratify the covenant. Noah offered a sacrifice to God when God made a covenant with Him. God also killed an animal to make clothes for Adam and Eve after they fell into sin. Why is blood so important in the Bible? Blood represents life. How do you feel when you see blood? Even a little blood makes many people queasy. If you were to see an animal sacrifice, I am almost sure it would be a sickening experience. This is not an enjoyable or light-hearted thing. Frankly, it is disgusting. It is horrible to witness. Then why do it? Sin is horrible and a horrible price must be paid for sin. Using blood shows that no half-measures will do. Sin cannot just be swept under the rug. Sin cannot just be forgotten about or ignored. The blood reminds us that someone must pay and they must pay with their life. The disgusting nature of sacrifices is a vivid reminder (that would never be forgotten by those who witnessed it) of the cost of sin. I have to think that anyone who had to offer an animal for their own sins or saw it offerred would be seriously deterred from sinning again so that they would avoid having to experience it again. Imagine for a minute that you had to go the market and buy an animal (such as a sheep or cow) each time you sinned. Then you had to take that animal to a slaughterhouse. There you had to place your hand on its head as it is killed, all because of you. Would that deter from you sinning? It would deter me. Verse 22 is a well-known verse. It is recited (and rightly so) to show that blood is necessary for forgiveness. Blood must be shed. Someone must pay. It says here that it can “almost be said…” That is probably because there were some other modes of cleansing including water and fire. What does the “copies of the things in the heavens” refer to? What did Jesus offer when He (perhaps figuratively) approached the presence of God on our behalf? What practical impact does the fact that Jesus need only die once have on us? How does this truth effect our lives today 2000 years after His sacrifice for us? When was the consummation of the ages? Will you face judgment? Believers do or don’t? What will happen at your judgment? Will you be judged/punished for your sins? How does the fact that there is a judgment after death effect our life on earth now? How does this well-known verse fit into the context? Why is it appointed for man to die? Why does God not allow us to keep on living forever? Are you waiting for Him? How should we wait for Him? What should we do while we wait for Him? Is there anything we can do to shorten this wait? Verses 23-24 again compare Christ’s sacrifice with the animal sacrifices in the OT. The tabernacle in the OT was cleansed with the blood of animal sacrifices. Christ appears (perhaps figuratively) in God’s presence in heaven on our behalf. From the beginning of the chapter we remember that He appeared there to offer His own blood for us. His sacrifice is better. He is God’s own Son. He is eternal, all-powerful, all-knowing, all-wise, and sinless. Hebrews focuses on the superiority of Christ. Here we see the superiority of His sacrifice. We have looked at the deterrent to sinning of offering blood sacrifices. Does Christ’s sacrifice for you deter you from sinning? Or does it feel too distant or too long ago to have an effect? How can we think of Jesus’ sacrifice in a way that would help deter us from sinning? I think we need to realize that Jesus faced real, pain for every single sin we ever commit. If we approach Jesus’ death in a logical manner we can understand that Jesus took the punishment for us. He therefore took every bit of punishment you deserved to take for your own sins. If you commit 100 sins in your life, Jesus took that amount of punishment. If you commit 1000 sins in your life, Jesus took that amount of punishment. One could argue that Jesus already took the punishment so it is ancient history and doesn’t matter. We don’t have to get too technical in this and it is hard to understand anyway how it all works since we are limited by time and space and God is not. But the basic lessons it that Jesus suffers/suffered for each one of our sins. He is taking the punishment. Next time you are considering whether or not to sin, remind yourself that if you do your punishment is heaped on Christ. His sacrifice doesn’t mean that no one suffers for it. If sacrificing an animal with no soul, rational thought, or morals would deter us from sinning, how much more God’s one and only Son, the perfect Creator of the universe? Verses 25-26 – These verses reiterate the fact that Jesus’ sacrifice is once-for-all. He doesn’t need to do it year by year. It doesn’t need to be repeated. He suffered once at the consummation of all ages. Basically it means that Jesus’ death is the climax of human history. Everything before it was building up to it. Everything since is affected by it. What application can we get from this truth? Our salvation is secure. A new sin that we do will not require that Christ be crucified again. It is complete. Don’t try to make up for your sins by in some way earning salvation. You can’t. Entrust yourself to Christ. We must work to remember it. For animal sacrifices they had to do them again and again. This gave them a continual reminder of the cost of sin. For us it could be easy to forget about the cost of sin because of the time gap between us and when its price was paid. Don’t forget. Forgetting the cost of sin removes one obstacle from sinning. Verse 27 – It is appointed for us to die once. Death is part of God’s plan for us. Apart from His second coming, there is no avoiding it no matter how hard you try. Why did God appoint everyone to die? Death is punishment for sin as God told Adam and Eve in the garden. At the same time, death is a blessing in disguise for us. It gaurantees that we need not live forever under the curse of sin. Death can be a new beginning, meaning that those with eternal life can live forever in God’s presence without the consequences of sin. What application should we get from the fact that we will die? Discuss. There are many! Judgment – Read cross-references. How do explain this concept to a new believer? Why is it important? How would knowing judgment is coming effect our life on earth now? Verse 28a – His second coming is not about coming to save us from our sin. His first sacrifice already accomplished this. If you recall, Jesus on the cross said, “It is finished.” His second coming actually verifies that His sacrifice was accepted in a similar way that the high priest coming back out of the holy of holies (intact, they actually attached a rope to his ankle to pull him out in case he died inside) showed that his sacrifice on behalf of the people was accepted by God. Verse 29a – Here it says that the salvation is for those who eagerly wait for Him. This implies that all true believers should fall into this category. When you wait for somebody you are thinking about their coming. You are also preparing for their coming. How can we prepare for His return? How does this verse say we should be waiting? Are you eagerly waiting? Are you prepared? You should consider what you need to do to get to the point where you can say, “I am ready.” Then do it! See Matthew 24:14 for something we can do which can theoretically speed His return (though of course His time is set already, but He does say this will happen first). Application: What do you need to do to apply today’s lesson?